If there's no mystery in our history then its not called history. The events which happened in the past and the circumstances leading to them have always intrigued historians and treasure hunters. Kingdoms, empires and their rich heritage and persona have left a lot of things unsaid for the modern day man. The things of the past by far are the most interesting aspect which continues to entice and bedazzle man time and again. Author Pankaj Misra in his debut novel "The Himalayan Revelation" takes readers on a journey which can be remembered for a lifetime. So is this journey glittering just like the others? Let's find out. 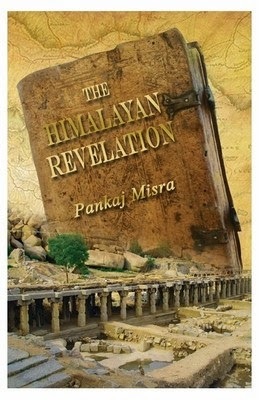 The Himalayan Revelation is a work of fiction but developed using genuine facts from history and modern times. It is a gripping tale of mystery, adventure, romance and international intrigue. Today Hampi is a UNESCO World Heritage Site. But around 450 years back, this capital of the magnificent Vijayanagar Empire was brutally plundered and devastated. But before it happened, its masters hid a secret. Centuries later, a young couple chance upon an object that holds a secret much more than Hampi had hidden, in a place 2000 miles far north of Hampi - the Himalayas. The Himalayas have something to tell and when they do - two nations become so desperate to get it that they are ready to go to any lengths, even global annihilation. First look at the title and the cover and the readers will get the basic idea behind the book. It's a historical fiction mixed with some real history and some events made up to make it look interesting. The cover image attracts the readers to itself. The blurb talks about an empire which had a rich history but now lies in ruins. But there's more to it than meets the eye. It's a very good blurb giving out absolutely nothing to the readers. The story starts off in the present time where Gaurav is on a trip to Leh and wants to explore the natural beauty and bliss of the place. He joins Genesis3D in Bangalore where he gets a wonderful opportunity to showcase his talents. But things don't go as planned and he ends up in one of the oldest monasteries in Leh and gets to meet Thipsey and Kunchen Lama who are the monks in that monastery. It all fascinates him and he leaves with wonderful memories of the place. Back home they get a project to digitize the historical places and their accounts as Meesha comes on board with Natasha for this project and they select Hampi for this. An exploration of Hampi leads to a new mystery and from there on it keeps getting complicated as they stumble upon something which happened 450 years back when Vijayanagar was the threshold of Hampi and a battle which wiped it out from the face of the earth completely. But now intrigued by the developments their journey takes them from Leh to Bangalore to the unexplored confines of Himalaya which have been unknown to man. But it has more to it as Chinese govt. also gets involved in this pursuit and Indian intelligence agencies too put up a brave show to put an end to this mystery. What is there in Hampi for Natasha & Gaurav to discover? Will this project be over? What will China gain out of it? Will two nations be able to prevent a world wide collapse? What has history hidden in it's womb till now and why it becomes cause of concern for various people and organizations? This is what the story is all about. Brilliant and captivating are the two words which fit perfectly well for the story. The history mingled with fiction makes it an absolute treat for the readers. The mysteries, historical relevance's, modern day approach and curiosity of the characters makes the story all the more exciting and spiced up. There's not a single dull moment in the back. It's thrilling narration and pacy outlook makes it a lovely dose for the readers. There's hardly any time to catch the breath in this story. The mesmerizing details laden with historical references are the perfect flavor of the book. The downside of the book is that the romance angle could have been kept to a minimum. It didn't suit the story. Also Vijayanagar empire's relevance towards the second half drops down a bit which should have been maintained equally like the other relevant things in the plot. Overall it's an excellent book in the making for the readers. The fluidity and the detailed narrative and the thrilling action all along makes it a perfect read for the readers. It's a book which can sweep readers off it's feet anytime as there is everything like drama, mystery, history, action, thrills which makes the mood of the readers. As it's said there's no history without mystery. It's a journey which every reader should definitely undertake.